If both living space and storage space is tight at your home, one of two things usually happens: either you simply aren’t able to have all of the things you want to have or you do and they are strewn about haphazardly. While many homeowners don’t think it’s possible to organize a small space in a beautiful, functional way, it is! Here are some tips. This might be the king of all small space organizational tips. When in doubt, look upward. The majority of homeowners leave a lot of wall space unused, and that’s fine if you have a lot of square footage. However, it’s certainly not ok for someone trying to pack a life into a small house. While there are plenty of creative ideas for maximizing vertical storage, the easiest and most common are shelves, hooks, and hanging baskets. As a rule, you should try to limit furniture that doesn’t contain extra storage. For example, opt for a coffee table that’s hollow inside instead of one made of solid material. Your side tables should have drawers, as well. Your ottoman, bed frame, entertainment center, etc, should be full of nooks and crannies for extra storage. And if you think functionality means ugly, think again! Also, remember this: you'll need storage solutions for any outdoor stuff. You can use deck boxes and benches in the same way to store thing like cushions, pool supplies, and outdoor toys. When you’re trying to create space and organization in a small house, the fewer actual items you can have, the better. That’s why it’s vital that you cut unitaskers from your life as often as you can. Most things in your house should be able to perform more than one task and be a true multitasker. Get a washer/dryer combo unit instead of two separate machines. Buy a small toaster oven that has multiple functions. Make sure your nightstand doubles as an organizational tool, complete with storage. This rule also applies to kitchen items. You must use every bit of space you have. This means more than simply making sure every drawer, cabinet, and closet is filled to the brim (in a non-chaotic manner, of course). This means maximizing these small space even more. As Apartment Therapy suggests, “add hooks [under kitchen shelves] to hang towels and pot holders … use the inside of cabinet doors to hang up cleaning supplies, and consider expandable [drawer] racks or slide out entries.” You can also use thin, vertical slide-out spice racks from The Container Store to use between your fridge and wall space. Also, make use the of the space under your bed. Downsize lately? If not, it is time. All the creative storage space in the world won’t make up for a pack rat mentality. The best way to make a small space more beautiful, organized, and spacious is to cut the clutter. To kickstart your decluttering efforts, play the 10/10/10 game. Find 10 items you want to keep, 10 you want to donate, and 10 you can throw away. After you’ve accomplished that goal, move on to some of these quick tasks. 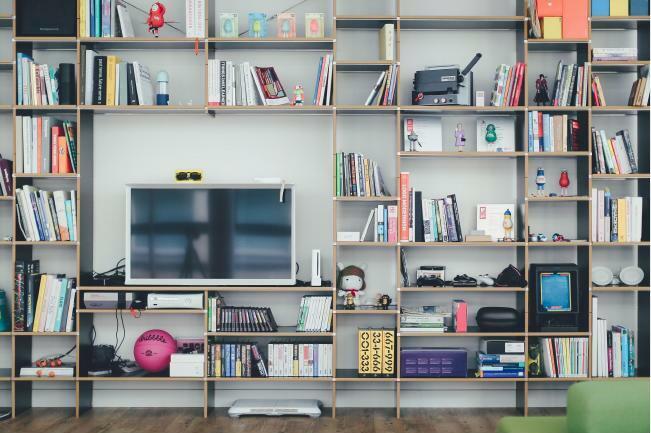 If there’s one main takeaway it is this: in a small home, any living space that isn’t primed for storage and organizational space is wasted space. Start by cutting down on the stuff you already have, get rid of single-purpose items, and then move on to finding creative ways to store your pared-down possessions.